Donate food in bins at many local organizations or participate in a special food drive. Also, drop off non-perishable food at Falls Food Pantry 24 hours a day/7 days a week. Simply leave your donation inside our unlocked foyer. Falls Food Pantry cannot distribute food received in compromised packages (dented cans, crushed boxes, damaged bottles or lids, etc.) or expired food. A good rule of thumb: If you’d serve it, we want it! Falls Area Community Services, Inc.
Hosting a food drive is a hands-on way for your school, office, group or place of worship to join the fight against hunger. Drives can be held year-round and are an important resource for Falls Food Pantry. Hosting a drive is easy, and we will help you through the process. Please e-mail us to receive tips for planning a successful drive and to register your event. Also see the Plan an Event information on our Events page. Make a difference and Adopt-A-Shelf by selecting a food shelf at the Pantry and bringing in those items every week for a month. Or, Adopt-A-Utility by selecting a utility and cover those expenses for a month or a year -- whatever time frame matches your ability to donate. 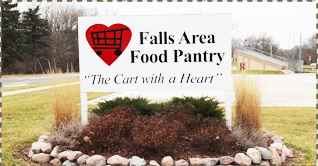 Falls Food Pantry is run exclusively by volunteers. We always need volunteers from our community to help with the many Pantry activities. Volunteers register and check in clients, help clients select food, and sort food and stock the shelves. They also assist with food drives and special events. To volunteer, contact your church if it is one of the 12 Partnering Churches. If not, call us at (262)251-6848 or send us an e-mail. A special thanks to our many volunteers!